Innkeepers Parmigiana - Crumbed Tasmanian chicken breast, arabiata sauce, provolone cheese, pesto, hand cut chips & garden salad. 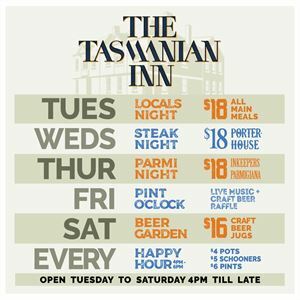 Dine on classic fare at one of Hobart's original pubs dating back to the 1850s at the Tasmanian Inn Hotel on Campbell Street. If only these walls could talk, guests would be regaled with stories of the old days while relaxing in refurbished surrounds that welcome visitors and locals alike to take a seat with a cold one in hand and chill out by a crackling fire. 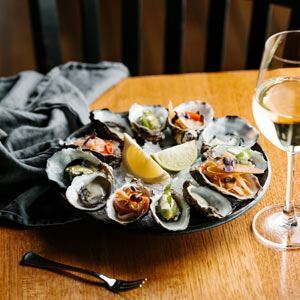 Locally produced beer and wine complement an exciting menu showcasing some of Tasmania's finest produce, with starters like salted local white fish croquettes, with potato and lemon, herb and caper mayonnaise. For the main affair, chow down on housemade pork sausages, potato puree, onion confit, gravy, grain mustard and green apple relish; or wrap your hands around a buttermilk fried chicken burger with coleslaw and tomato chutney.